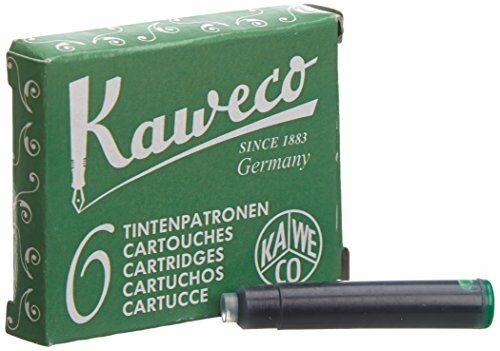 Pk/6 Kaweco Standard International Fountain Pen Ink Cartridges, Black Pack of 6 Kaweco standard international (also called universal) size ink cartridges. For all Kaweco fountain pens and any other fountain pen accepting the international format ink cartridge. Made in Germany. Additional Images: 1.5" long x .25" diameter The cartridges fit the following brands (compare your cartridge size to be sure as not all models take this universal cartridge):Acme, Ancora, Bossert & Erhard, Bexley, Caran d'Ache, Cartier, Colibri, Conklin, Conway Stewart, Daniel Hechter, DaniTrio, David Oscarson, Delta, Elysee, Faber Castell, Itoya, Jorg Hysek, J.P. Lepine, Lalax, Libelle, Loiminchay, Marlin, Michel Perchin, MontBlanc, Montegrappa, Monteverde, Nettuno, Northpoint, Omas, Pelikan, Recife, Regal, Retro 1951, Rosetta, Rotring, S T Dupont, Sensa, Signum, Stipula, Taccia, Tombow, Visconti, Waterford, Yard-O-Led & many others.These cartridges DO NOT FIT pens that take proprietary cartridges: Parker, Sheaffer, Cross, Waterman, Aurora, Lamy and Pilot. Kaweco Fountain Pen Ink Cartridges short, 8 colors, 8 x 6 piecesInternational standard format.Colours: Royal Blue (Blue), Midnight Blue (Blue black), Paradise Blue (Turquise), Caramel Brown (Brown), Pearl Black (Black), Summer Purple (Purple), Palm Green (Green), Ruby Red (Red)Suitable for fountain pens from Pelikan, Faber-Castell, Diplomat, Brunnen, Kaweco, Caran dAche, Waldmann, Tombow, Delta, Omas, Mercedes, Big, Online,...Not suitable for Aurora, Cross, Lamy, Montblanc, Parker, Pilot, Sheaffer. 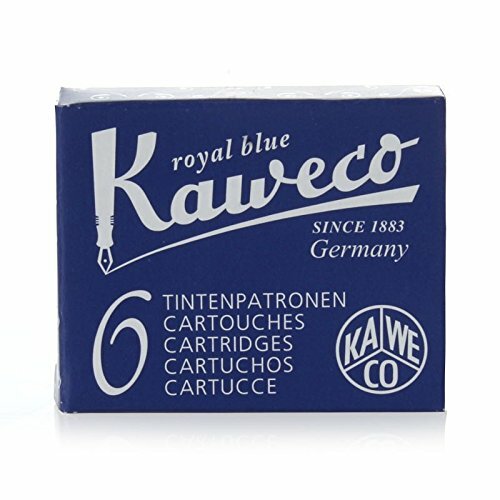 Pk/6 Kaweco Standard International Fountain Pen Ink Cartridges, Midnight Blue (Blue-Black) Pack of 6 Kaweco standard international (also called universal) size ink cartridges. 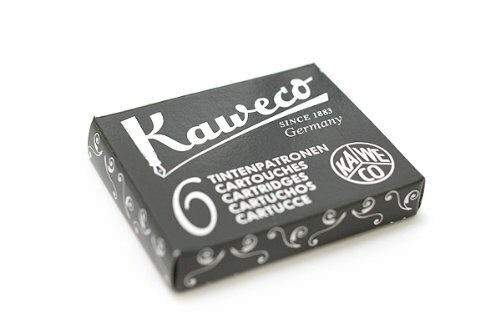 For all Kaweco fountain pens and any other fountain pen accepting the international format ink cartridge. Made in Germany. Additional Images: 1.5" long x .25" diameter The cartridges fit the following brands (compare your cartridge size to be sure as not all models take this universal cartridge):Acme, Ancora, Bossert & Erhard, Bexley, Caran d'Ache, Cartier, Colibri, Conklin, Conway Stewart, Daniel Hechter, DaniTrio, David Oscarson, Delta, Elysee, Faber Castell, Itoya, Jorg Hysek, J.P. Lepine, Lalax, Libelle, Loiminchay, Marlin, Michel Perchin, MontBlanc, Montegrappa, Monteverde, Nettuno, Northpoint, Omas, Pelikan, Recife, Regal, Retro 1951, Rosetta, Rotring, S T Dupont, Sensa, Signum, Stipula, Taccia, Tombow, Visconti, Waterford, Yard-O-Led & many others.These cartridges DO NOT FIT pens that take proprietary cartridges: Parker, Sheaffer, Cross, Waterman, Aurora, Lamy and Pilot. 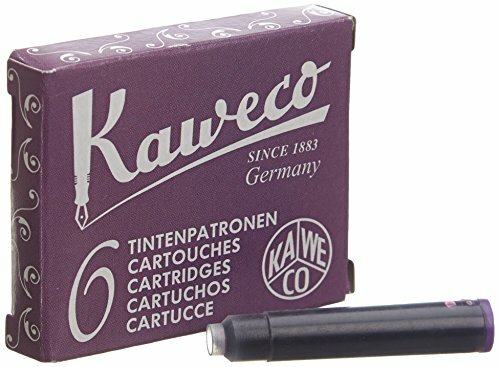 Pk/6 Kaweco Standard International Fountain Pen Ink Cartridges, Summer Purple (Violet) Pack of 6 Kaweco standard international (also called universal) size ink cartridges. For all Kaweco fountain pens and any other fountain pen accepting the international format ink cartridge. Made in Germany. Additional Images: 1.5" long x .25" diameter The cartridges fit the following brands (compare your cartridge size to be sure as not all models take this universal cartridge):Acme, Ancora, Bossert & Erhard, Bexley, Caran d'Ache, Cartier, Colibri, Conklin, Conway Stewart, Daniel Hechter, DaniTrio, David Oscarson, Delta, Elysee, Faber Castell, Itoya, Jorg Hysek, J.P. Lepine, Lalax, Libelle, Loiminchay, Marlin, Michel Perchin, MontBlanc, Montegrappa, Monteverde, Nettuno, Northpoint, Omas, Pelikan, Recife, Regal, Retro 1951, Rosetta, Rotring, S T Dupont, Sensa, Signum, Stipula, Taccia, Tombow, Visconti, Waterford, Yard-O-Led & many others.These cartridges DO NOT FIT pens that take proprietary cartridges: Parker, Sheaffer, Cross, Waterman, Aurora, Lamy and Pilot. 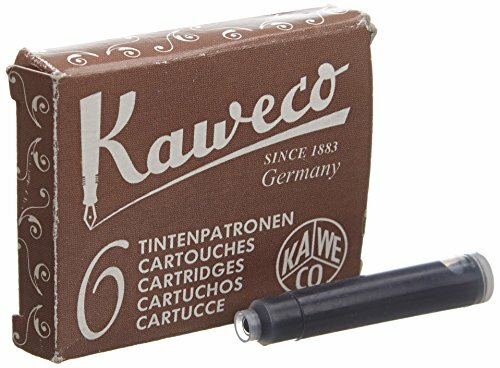 Pk/6 Kaweco Standard International Fountain Pen Ink Cartridges, Caramel Brown (Sepia) Pack of 6 Kaweco standard international (also called universal) size ink cartridges. For all Kaweco fountain pens and any other fountain pen accepting the international format ink cartridge. Made in Germany. Additional Images: 1.5" long x .25" diameter The cartridges fit the following brands (compare your cartridge size to be sure as not all models take this universal cartridge):Acme, Ancora, Bossert & Erhard, Bexley, Caran d'Ache, Cartier, Colibri, Conklin, Conway Stewart, Daniel Hechter, DaniTrio, David Oscarson, Delta, Elysee, Faber Castell, Itoya, Jorg Hysek, J.P. Lepine, Lalax, Libelle, Loiminchay, Marlin, Michel Perchin, MontBlanc, Montegrappa, Monteverde, Nettuno, Northpoint, Omas, Pelikan, Recife, Regal, Retro 1951, Rosetta, Rotring, S T Dupont, Sensa, Signum, Stipula, Taccia, Tombow, Visconti, Waterford, Yard-O-Led & many others.These cartridges DO NOT FIT pens that take proprietary cartridges: Parker, Sheaffer, Cross, Waterman, Aurora, Lamy and Pilot. 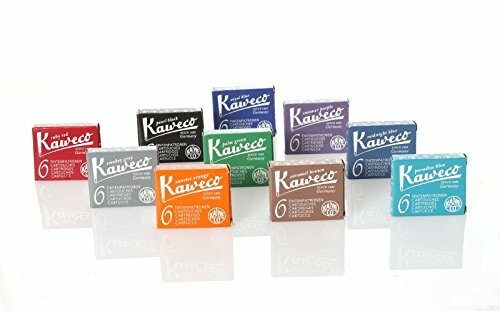 Kaweco Fountain Pen Ink Cartridges short, 10 colors, 10 x 6 piecesInternational standard format.Colours: Royal Blue (Blue), Midnight Blue (Blue black), Paradise Blue (Turquise), Caramel Brown (Brown), Pearl Black (Black), Summer Purple (Purple), Palm Green (Green), Ruby Red (Red), Sunrise Orange (Orange), Smokey Grey (Grey).Suitable for fountain pens from Pelikan, Faber-Castell, Diplomat, Brunnen, Kaweco, Caran dAche, Waldmann, Tombow, Delta, Omas, Mercedes, Big, Online,...Not suitable for Aurora, Cross, Lamy, Montblanc, Parker, Pilot, Sheaffer. 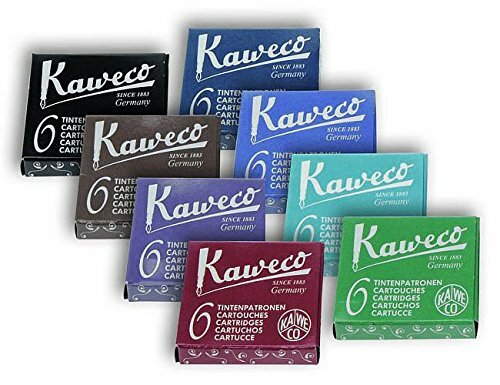 Kaweco Palm Green Fountain Pen ink cartridge are short International size. There are six in a pack. 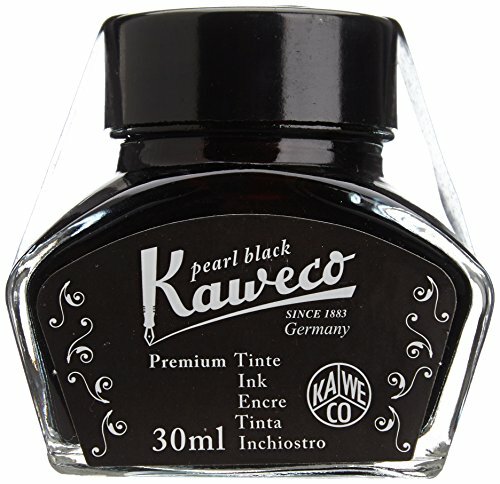 Kaweco inkwell premium ink pearl black 30ml. Kaweco Fountain Pen Ink Cartridges short, Pearl Black (Black), 30 pc.International standard format, 5 x 6 piecesSuitable for fountain pens from Pelikan, Faber-Castell, Diplomat, Brunnen, Kaweco, Caran dAche, Waldmann, Tombow, Delta, Omas, Mercedes, Big, Online,...Not suitable for Aurora, Cross, Lamy, Montblanc, Parker, Pilot, Sheaffer. A review of some inks kaweco gave to me. Ruby Red, Royal Blue, Smokey Grey, and Sunrise Orange. My favorite is Royal Blue. Tell me what your favorite is in the comments. 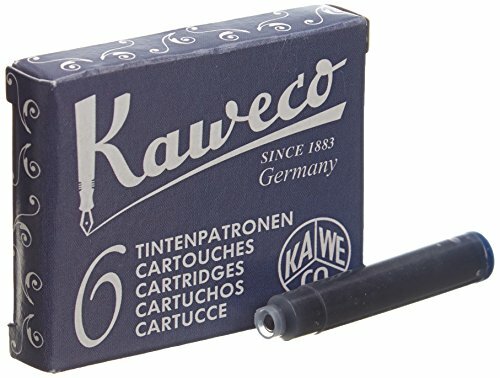 Compare prices on Kaweco Ink at ShoppinGent.com – use promo codes and coupons for best offers and deals. Start smart buying with ShoppinGent.com right now and choose your golden price on every purchase.